SF Chronicle, 30 May 1948. Read whole article here. The survey asked about 220 students in grades three through six about how many radios they had, when and what they listened to, and what their favorite programs were. 1946, Sunnyside School. Ms Carol White’s third-grade class. Not a particularly diverse school body at that time. Courtesy Bill Wilson. 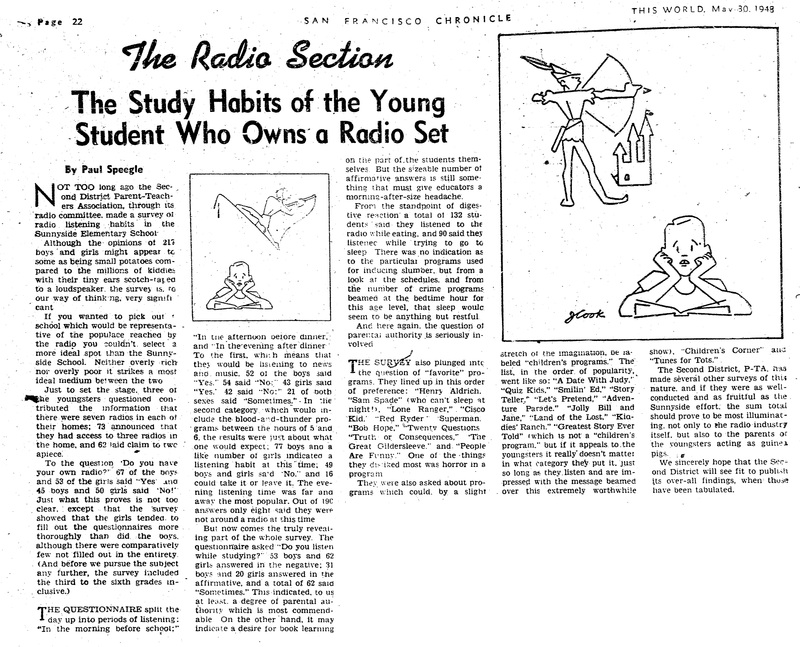 Two thirds of the students had two or more radios in the home. One third had three or more. Over half of the students had their own radio. Three students claimed to have seven radios at home! Top favorite programs featured “Sam Spade” and “The Aldrich Family.” These programs came on after 9:30 pm at night on school nights, surprisingly. Listen to a clip of “The Aldrich Family” here (MP3). 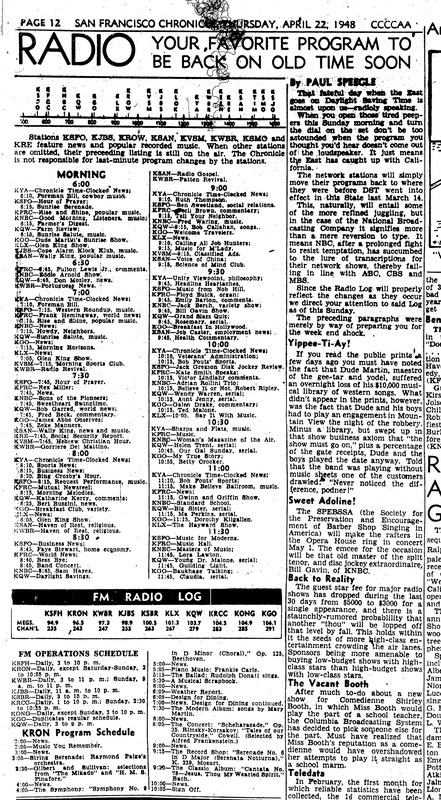 View an SF Chronicle Radio Log here (JPG). Favorite children’s programs included “Quiz Kids” on Sunday afternoons. Listen to a clip of “Quiz Kids” here (MP3). Listen to a whole program here (Youtube). The question about when the students listened revealed that just over half tuned in before school — which the reporter noted meant news and music. About three-quarters listened in the afternoons, which meant children’s programming, followed by “blood-and-thunder” programs just before dinner. All but eight students said they listened to the radio in the evening, perhaps with their family. The radio was also on for about half the students while they studied, at least some of the time. Sixty percent also listened while they ate. Listening to the radio. From otrcat.com. Four in ten students said they listened while going to sleep. Soon, of course, the rise of the television would eclipse the radio, replacing the audio world with visuals that were far more compelling. But this survey reveals what at remarkably presence radio had in the lives of 8-to-12-year-olds in the decades before the TV. More about Sunnyside School here. 1940s. Sunnyside School, Foerster Street said. San Francisco History Center, San Francisco Public Library.